Halloween has been referred to as the Devil's holiday, but all 365 1/4 days were created by and belong to Jesus. If Satan usurps even one day it is our Christian duty and responsibility to reclaim and redeem it in the name of our Lord. Are the imaginary ghouls and goblins of Halloween any more wicked than the jolly elf called Santa Claus, or the Easter bunny? Should the Church stop celebrating these holy days, the bookends of our faith, as well? Instead of battling the spiritual enemy on Halloween, the Church is guilty of crossing swords with one another. We fight among ourselves, not about "how" to celebrate Halloween, but whether it should even be observed. Jesus is more the "reason for the season" on Halloween than He is at Christmas. The Church must realize it is forfeiting Halloween as an opportunity to glorify the Prince of Peace, the One who has given us the victory over the "prince of darkness" and his evil minions. The Way, the Truth and the Life has conquered Death and the grave. By dressing up in costumes and portraying frightening creatures who at one time caused us to fear and tremble, we are not glorifying Satan. 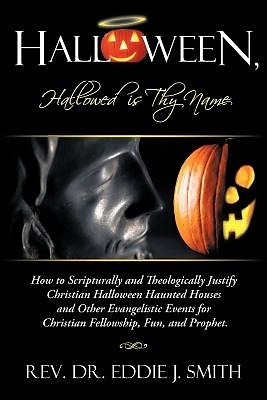 Rather, we are poking fun at the Serpent whose kingdom has been plundered by our Savior, and whose head has been crushed Should we celebrate Halloween? The question is, "How can we not?" Halloween, Hallowed is Thy Name offers a believer confidence and joy in expressing the greeting "Happy Halloween."